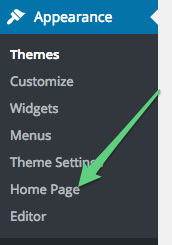 Ultra gives you the option to dive head first into your home page using SiteOrigin’s Page Builder plugin. If you’d like to edit the default home page Ultra comes with or get going with your own custom Page Builder home page, go to AppearanceHome Page. Using the ON/OFF toggle at the top of this page you can convert your home page into a static home page. This is the same as creating a page under Pages called Home and assigning it as your static home page under SettingsReading. This one button takes care of this for you. Once turned ON you can also manage your custom home page via PagesHome. For more on Page Builder and a link to the Page Builder documentation please see our overview page. Easily toggle the home page ON/OFF. If you don’t have Page Builder installed, you can install from this page. We also recommend the SiteOrigin Widgets Bundle is an awesome collection of widgets that can be used in Page Builder or in any theme widget area. Plugins can be easily installed from PluginsAdd New. Use the search field in the top right, most plugins are easily found by typing in their name.